youre flagging and using fire? and you have privileges to do so? What does "It is off-topic here because of Debian" mean in this comment? as far i guessed he was referring to libjpeg8_8d-1+deb7u1_amd64.deb which looks like a Debian package. I still think it's unclear, not off-topic. (It's closed now, as unclear.) If they give more details we can know. Perhaps they are installing packages meant for Debian on Ubuntu. That usually works, but sometimes causes problems. Do you think they are suggesting that there is an application you can use to manage dynamic disks, but they don't know how to use it? Maybe. @Videonauth's edit improves the post somewhat. I don't think that question is no repro. Their answer is bad -- you shouldn't run Android Studio as root -- but it's a recent question and nobody has asked for more information about how they installed it (though I'll do so shortly). The problem didn't go away mysteriously. want me to retract my CV? Well, only if you agree with my reasoning (or have other reasons to have changed your mind). I agree partly with your reasoning and I'm someone who is willing to give the question a second chance. I should possibly have commented on the question rather than the answer so other reviewers are more likely to see. But my comment is really a response to the answer. But aren't we the close vote brigade? why would that be close voted? Q: how to setup two factor authentication in Ubuntu for Ubuntu users using Google authenticator? How to setup two factor authentication in Ubuntu for Ubuntu users using Google authenticator (It can also be setup for non Google accounts)? Is it reasonable to interpret this question as on-topic and answer it with information about monospaced fonts in Ubuntu? If not, I'll VTC it. Do you want to post an answer? Well you can review it now. But you don't have to review to post an answer. Oh. Should it be duped? Is there an answer somewhere else? Can you find it by searching? Is it by the same user? > Thank you for reviewing 20 close votes today; come back in 9 hours to continue reviewing. I just noticed another Bash post of mine that needs fixing, and I won't likely get around to posting other answers (unless they're very simple) until I've done that. But if this can be considered on-topic and answered, then it's probably best to do that. Also, the topic of fonts in Ubuntu is actually not something I know a great deal about. It seems to me that this question should be closed as a duplicate, or answered, or commented on to request specific information (in which case the "unclear" close vote might be correct, depending on what information is requested), but that it should not otherwise be closed. @Videonauth This is with full disk encryption (LUKS)? I thought you were testing encrypted home directories. Do you want to comment to request more information? Should I? Or to suggest that question? Unless there's a sign it's NTFS, I don't know if it should be duped to that without further information. Is How to recover Windows 7 files a duplicate of Recovering broken or deleted NTFS partitions? I'm not sure. @Zanna Actually, never mind. It's not NTFS. They accidentally deleted their "main partition" when they went to "reinstall Ubuntu," so it's an Ubuntu system partition (ext4). So the question is clear after all. @Videonauth I think that post is just on the "Looks OK" side of the line, and that's how I've reviewed it. Your edit definitely helped. But would it be useful for us to request more (specific) information? @Zanna I've voted to dupe that question while also commenting to address the ambiguity. Although I understand the reasoning for why it might be, I don't think this question is too broad. If it were just worded differently, it could have explicitly asked for all that stuff and been far less likely to attract "too broad" close votes. It's effectively asking two different things... but the OP and other readers would have to already know the answers to both in order for it to make sense to ask them separately. A possible counter-argument is that the two things it's asking could be answered separately... but it would be hard to do so. It's asking what sets PS1, and also why there's no export line for it in a startup script. Your answer, @Zanna, answers the first part. @Videonauth Even when the user is not logged on? @Videonauth Oh. Well that's probably fine then. @Videonauth Had I said that? If so, I should correct it. Or was that in one of the heavily criticized answers about privacy with two sudoers? Are you still getting that? I tried immediately after you posted that, and it loaded fine for me. It's still working for me. > Previous answers don't apply fully, if you marked encrypt home folder while installing Ubuntu. This guarantees encrypted home folders for every user, even so root can't read the data without the proper password of the user/owner of that home folder. Perhaps the answer could be edited so that it specifically describes the actual behavior. Certainly it's possible to create new users with encrypted home directories, so the basic technique should work so long as one actually does that. I think such an edit would be just inside the line of how much it is reasonable to change someone else's answer; if the information can be given correctly, I'd say go for it. There does remain the question of whether or not the data can be decrypted without entering the user's password, when they are not logged in. I think that's one of the things you're planning to test. I think it cannot (short of actually cracking the encryption). I think the key is not stored in cleartext but must itself be decrypted using the user's password. Is the user michael logged out completely? And are the data in that user's home directory decrypted? @Videonauth Can you try it with that user completely logged out? That makes sense. Though if logging out is insufficient, that does somewhat limit the value of the method for the OP's situation. @Videonauth I think it's encrypted, and the user's password decrypts it. Doesn't resetting a password from recovery mode (or chrooting from a live environment to do it) cause the user's encrypted home directory, if they have one, to become inaccessible to them, such that special steps are required to decrypt the key using the old password? That was my understanding. Do we have a question for this on the site? Though arguably unclear, I think we should just dupe this question to both the suggested originals. One or the other (or both) almost certainly apply to the OP's situation, and to that of anyone who finds that question by searching. Users' password hashes are not stored in their home directories. But I mean when the user actually logs in. 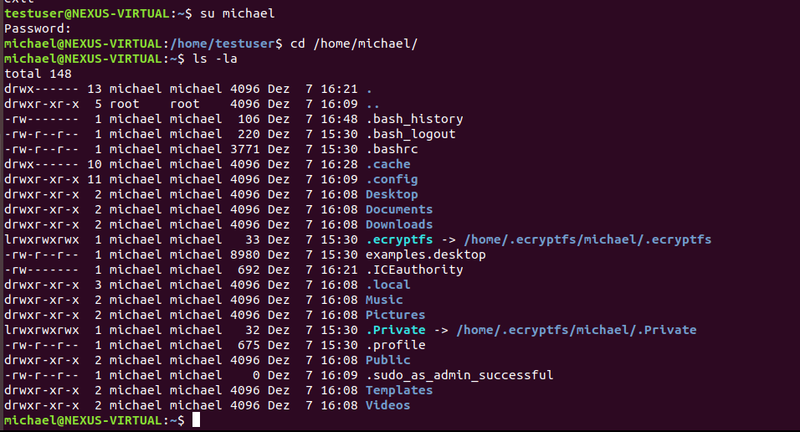 Doesn't that also decrypt their home directory? Isn't it done as part of the login process? By a PAM module or something? yep its done by a pam module, but without the key belonging to the user how should it be decrypted then? I'm not sure. Maybe this is relevant. I don't think this is really unclear. Although I wish this question contained a more detailed description of what the OP did, I don't think we should close it. I would consider the top comment to be a possible answer; I've replied to suggest the commenter post one. I think this is no longer needed. @Videonauth Can the wrapped passphrase be used without being decrypted by the user's login password (or cracked)? Or am I misunderstanding how it works? I'm not too worried about how crackable the encryption is, for the purposes of that answer. You could mention the possibility of cracking and keyloggers in an updated comment (or in an edit, if that seems appropriate) but I think that, if the user's password is needed even for root to access the cleartext of a user's encrypted files that the user has not actually themselves decrypted by logging on, then the basic method in that answer is sound, and it just needs warnings added. Especially about how new user accounts' home folders aren't encrypted by default even if the first user's was... On the other hand, if that is possible without knowing the user's password, cracking keys, or waiting for the user to log in, then the basic method in the answer is probably at best of minor benefit. all comes down to "if i have physical access, youre hosed anyways"
I do think this is providing meaningful security, though. Not a lot of security, but more than nothing. There are varying degrees of access to physical hardware. If Alice has the ability to obtain Bob's secrets, but she has to undertake specific action to achieve this, which doesn't work until then Bob subsequently takes action, that's different from Alice just being able to type one command and instantly access Bob's secrets. We have all sorts of security measures that can be defeated with full access to physical hardware. Virtual consoles and display managers are configured by default to require that users log in with their passwords. Users with the power to run commands as root with sudo by default must enter their passwords again to run commands as root, even though of course either full physical access or just access to run non-privileged commands as that user are sufficient to capture their password. The list goes on and on. These things aren't worthless. "Not worthless" means something, considering how many precautions people take in the name of security that actually are totally worthless, like allowing a user to only run a few commands as root... but one of them is vim. How secure are chroot jails? sorry, I was writing an answer! Thank you for writing answers! I have not been writing a lot of answers lately. During the upcoming time of Winter Hats, I hope to write at least a hundred CW answers based on comments that should've been posted as answers. @EliahKagan I hope there's a hat for that! I'll move them (but not the encryption stuff) somewhat soon. This question is quite valuable and I hope it is never deleted. Is it a duplicate of something, though? I don't know - do you mean, something not specific to WSL? @Zanna Maybe. Though the detail about how the initial shell used in WSL isn't a login shell is somewhat important to that question. One should pretty much never set a prompt directly in a file like ~/.bash_profile, though, and for that I'm sure we have something else. @Videonauth I think it's fine. If later it seems too much to keep here, they can go to the Island. This is all a big gray area anyway, since the messages are about improving content on the site, so they're not really off-topic for the Downboat, so much as they have the potential to become drawn out and highly technical. The same logic of replies would be retained if they were moved (they were interspersed with the Bash messages here anyway, after all). But it may be unnecessary to move them. That is, after all, what the site is for. I mean, I don't want to minimize the importance of questions and answers, which are the form technical content is most useful in here. But the whole point of cleanup is to support that, not the other way around. Answers don't exist so reviewers can feel useful, or even to be voted on. @Zanna Is it okay with you if I move the fine print to the bottom in How can I reproduce the error “package… needs to be reinstalled, but I can't find an archive for it” for testing? and remove the horizontal rule? It's <sub>, so there will already be extra space, and I think most readers will benefit from reading the actual question first. VTC'd (an commented about what to do if they really did try all those answers). @Zanna I'll do so shortly. did you see the book info i have given above? @Zanna I've edited it. I also made some other changes. You can edit again (or roll back) if you don't want them. You might want to add a bit of information about where in the source code to look, but I didn't want to do that because I was already adding a good bit of additional material.